Snip Snap Snorem, or Snip Snap Snorum, is a matching-type card game heading a range of children's games which certainly go back to the 18th century and probably derive from a more ancient drinking and gambling game. Almost identical is the German game of Schipp-Schnapp-Schnurr-Burr-Basilorum, except that Kings are not stops but are followed by Ace, two, et cetera. There are several methods of playing the game, but in the most common a full whist pack is used and any number of players may take part. The pack is dealt, one card at a time, and the eldest hand places upon the table any card of his choosing. Each player in his turn then tries to match the card played just before his, making use of a prescribed formula if successful. Thus, if a King is played, the second player lays down another king (if he can) calling out "Snip!" The next player lays down the third King, saying "Snap!" and the next the fourth King with the word "Snorem." A player not being able to pair the card played may not discard, and the holder of Snorem has the privilege of beginning the next round. The player who gets rid of all his cards first wins a counter from his companions for each card still held by them. Earl of Coventry is just the same, but played without counters for a simple win. The leader says "There's as good as 6 can be" (if they had played a six). The second player says "There's a 6 as good as he", the third "There's the best of all the three", and the fourth "And there's the Earl of Coventry!" Optionally, players may be required to make a different rhyming statement every time they play a fourth card. 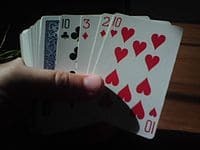 A related game called Jig is somewhat a cross between Snip-Snap and Stops, in that the aim of succeeding players is not to match rank but to play the next higher card of the same suit, from Ace low to King high. The leader plays any card and says "Snip", and the next four able to continue the sequence announce respectively "Snap", "Snorum", "Hicockalorum", "Jig". The last turns down the five-card sequence and starts a new one. When a sequence cannot be continued because the last card was a King or the next card has been played out, the last player says "Jig" regardless of position, and leads to the next round. As before, the first out of cards receives 1 counter for each card left in other players' hands.